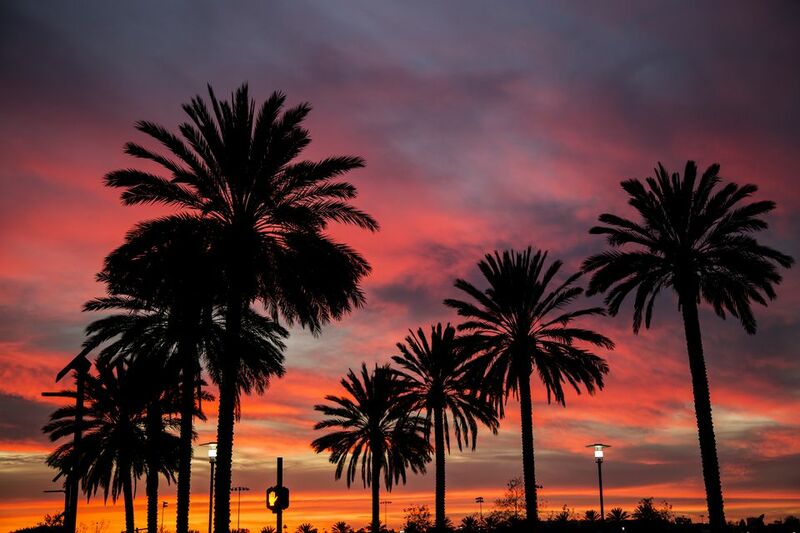 January is the month when visitors from colder climates fall in love with Los Angeles. The weather is often just right, and the sunsets are spectacular. The Rose Bowl Parade — which is the city's first big event of the new year — began as a way to show the rest of the country how gorgeous Southern California can be on New Year's Day. After the parade festivities are over, January is also a good time to enjoy the LA area tourist attractions. After the year-end crowds are gone, you can go anywhere without ending up shoulder-to-shoulder with other visitors. The only downside to a January visit is that it might rain. Unfortunately, it's hard to know whether that's likely to happen more than a week or two ahead of time. Yearly averages aren't helpful because they include years of drought and years of downpours. When it does rain, the entire month's precipitation sometimes falls in a single day. Pacific storms can whip up some eye-popping waves near the coast, and the sky is crystal clear afterward. If the weather tries to dampen your vacation fun, try these things to do on a rainy day in Los Angeles. Hours of Daylight: You'll have about 10 hours of daylight per day to explore Los Angeles in January. To find out what the weather is like during the rest of the year, check the guide to LA's average climate and weather. For rainy days, pack an umbrella but also bring a rain jacket with a hood for areas where an umbrella is too hard to manage in crowds or wind. Leave the heavy winter coat at home. A mid-weight jacket will be enough (or more than enough) on dry days. Layers are always a good idea, especially if you plan to spend part of your day near the beach. In LA, you can see whales nearly year-round. In the winter, you can watch gray whales as they migrate. Find the best places to see them and when to go in the guides to Los Angeles whale watching and Orange County whale watching. From January to March, more than 1,200 cultivars of flowering camellias make Huntington Gardens one of the best places in the country to see them. January is also an excellent time to visit Disneyland or go to Universal Studios Hollywood, especially if you avoid the Martin Luther King holiday weekend (which happens on the third Monday of the month). Park hours will be short, but crowds will be the smallest you'll encounter all year long. Rose Parade: Normally the big parade in Pasadena is on January 1, with one exception: When January 1 is a Sunday, the parade happens on January 2 instead. Rose Bowl Game: It's hard to get tickets for the annual football classic, but we've got all the ways you can do it. DineLA: January brings LA's version of Restaurant Week with special tasting menus and prices at tons of great spots. Photo L.A.: One of the premier photography events in the country, featuring work by many prominent artists. Lunar New Year: Lots of events celebrate the new year according to the Chinese calendar. The new year is a lunar holiday which may happen in January or February. Check out the Contenders: Film contenders, that is. The Armand Hammer Museum at UCLA hosts an annual exhibition of the year’s most noteworthy films. Many of them are good bets to win top honors during the annual awards season, and you can say you saw them first. When a cool day follows a winter rain, skies are sometimes exceptionally clear and ideal for photography. It's a good time to drive down Pacific Coast Highway and Palos Verdes Drive to Roessler Point where you can get a good view of the entire Los Angeles Basin. Continue south from there along the coast to San Pedro for offshore views that include Catalina Island. End your scenic drive by going north on Interstate 110 and then to the parking area at the Griffith Observatory. If you have a stereotypical idea of what Southern California beaches are like, reset your expectations. On many January days, it's too chilly to run around on the beach in your skimpiest swimwear and definitely too cold to go into the water unless you're wearing a full neoprene wetsuit. But that doesn't mean that a walk at the beach isn't a fun thing to do. The Golden Globe Awards are held at the Beverly Hilton in January. Beverly Hills hotels fill up, and both Santa Monica and Wilshire Boulevards clog up with traffic. Check the awards dates at the Golden Globe website.